Most disturbing, the salt content of fast foods like chicken nuggets in Australia can be more than twice as salty as similar meals in the UK. A new report from The George Institute for Global Health, VicHealth and the Heart Foundation analysed the salt content in kids’ meals from four major fast food outlets (Hungry Jack’s, KFC, McDonald’s and Subway) as part of a global push to reduce the salt content in children’s food during World Salt Awareness Week. The report found high levels and a huge variation in the salt content of children’s meals across the four chains. A kids’ chicken nuggets meal from Hungry Jack’s contained more than an entire day’s worth of salt for a 4-8 year old child, a McDonald’s Cheeseburger Happy Meal with fries contained almost two thirds of a day’s worth of salt, and a KFC Kids Meal Snack Popcorn contained almost half a days’ worth of salt. Subway Kids’ Paks were the least salty meal options, providing mini subs and purees rather than burgers with chips. All of their meals were found to be in the top five lowest salt kids’ meal options and contained one gram of salt or less per meal. Meals with fries were among the saltiest options. McDonalds was the only chain that provided apple slices, yoghurt and cherry tomatoes as an option, instead of fries. Heart Foundation dietitian Sian Armstrong said while none of the popular meals are healthy options, it was concerning to see some kids’ meals containing more than an entire day’s worth of salt. “An alarming 80 per cent of Aussie kids are eating too much salt with most of it coming from processed food and fast food takeaways,” Ms Armstrong said. “Consuming excess salt can lead to high blood pressure, a major risk for heart attack, stroke and kidney disease. Studies suggest that children with elevated blood pressure may go onto suffer it as adults. “Most parents know that fast food isn’t a healthy option for their kids, however they may not realise that a single kids’ meal could blow out an entire day’s salt intake. The average salt content of children’s meals across the four outlets was 1.57g of salt or 45% of a child’s recommended daily salt intake. The highest salt children’s meal was the Hungry Jack’s 6 Chicken Nugget Kids’ pack (includes a dipping sauce and small chips), which contained 3.78g salt or 108% of a 4-8-year-old child’s recommended daily salt intake. The lowest salt children’s meal was the Subway Kids’ Pak Veggie Delite Mini Sub, (includes a mini-sub and SPC puree snack), which contained 0.44g salt or 13% of a 4-8-year-old child’s daily recommended salt intake. McDonald’s is the only fast-food outlet offering fresh fruit (apple slices) and vegetables (grape tomatoes) with the Kids Meal packs. Within the retailers, there was a range in salt levels for children’s meals. For example, a McDonald’s Happy Meal containing 3 chicken nuggets, apple slices and water contains 16% of a 4-8-year-old child’s salt intake, whereas the saltier option of a cheeseburger, fries and water contains 66% of a 4-8-year-old child’s salt intake. 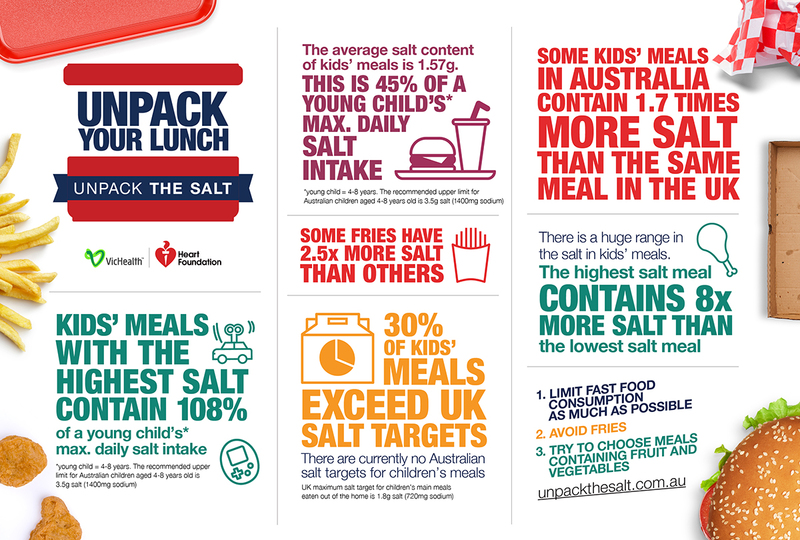 The UK set salt targets for takeaway kids’ meals of less than 1.8 grams of salt per meal. Thirty per cent of the meals analysed in this report exceeded this target. All Subway products met this target. The George Institute’s Public Health Nutritionist and the report’s lead author Clare Farrand said it was clear there needed to be more regulation on fast food outlets to make their products healthier. “It is unacceptable that some children’s meals in Australia are significantly saltier than similar meals purchased in the UK,” Ms Farrand said. “Kids aren’t born craving salty food – we develop this taste preference based on exposure so it’s really important parents limit the amount of salty food their kids eat,” Ms Reimers said. “Fast food really should be occasional treats, yet the average family has takeaway almost once a week. If you’re going to have takeaway foods, try less salty options with fresh fruit and vegetables included. Parents looking to lower their family’s salt intake can sign up to the Unpack Your Lunch 10-Day Salt Challenge where they will receive tips to reduce salt, blogs and low salt recipes. The Victorian Salt Reduction Partnership was established in 2014 in response to alarming high levels of salt consumption by the Victorian public. The partnership comprises of peak public health organisations: VicHealth, Heart Foundation, The George Institute for Global Health, Deakin University Institute for Physical Activity and Nutrition (IPAN), National Stroke Foundation, Kidney Health Australia, The Victorian Department for Health and Human Services, Baker Heart and Diabetes Institute, Food Innovation Australia Ltd, CSIRO and the High Blood Pressure Research Council. Australia is committed to meeting the World Health Organization’s target of 30 percent reduction in average population salt intake by 2025. To achieve this, the partnership has developed a comprehensive set of actions aimed at gaining consensus and commitment for salt reduction action from governments, public and industry in Victoria. The George Institute for Global Health – Clare Farrand, 0402 545 094, cfarrand@georgeinstitute.org.